The shortage of teachers in science and mathematics is a complex problem, involving many underlying causes and players. 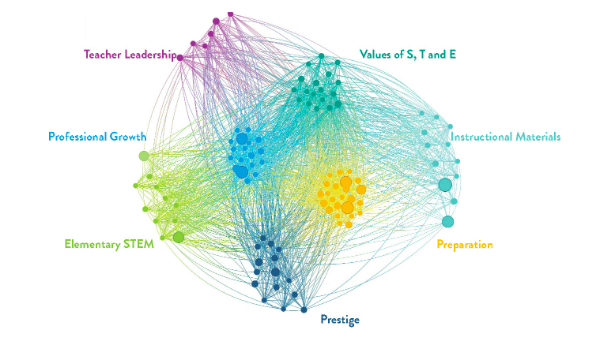 In an article for the Stanford Social Innovation Review, Talia Milgrom-Elcott and Eric L. Berlow describe a method of structural network analysis to understand and address this and other social problems. Network mapping is being used to address teacher shortages in STEM education, through an initiative called 100Kin10, which plans to provide 100,000 teachers in these fields over the next 10 years. The goal of network mapping is to identify and analyze the underlying challenges of teacher shortages, such as low prestige of the profession, lack of professional support, and limited access to high-quality materials. Addressing such challenges offers a chance to greatly expand the teaching corps and improve STEM education. The method offers new insight to solving such social problems by identifying the root causes through these maps rather than addressing the symptoms. They assert that these challenges are multi-faceted and require multi-faceted solutions.